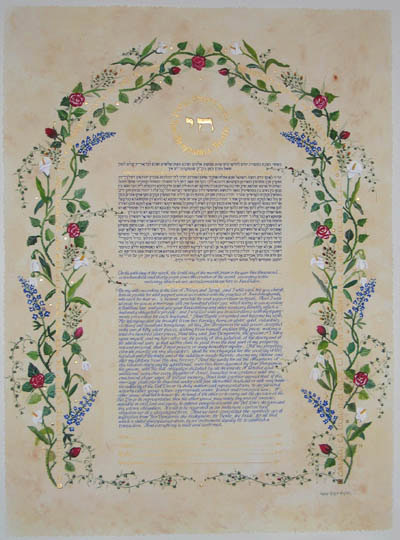 The personalized Ketubah includes the CHAI motif in raised 23K Gold Leaf (optional). Around the CHAI in a circle symbolizing a ring, are the names of the Bride and Groom. The Gate motif, which symbolizes the beginning of a life together, is constructed with verses from the "Song of Songs" and illuminated with Roses, Blue Bonnets, Calla Lilies and Snow Drops. The text was written in two shades of blue - the Hebrew with darker blue and the English lighter writing, on the "parchment" background.